A virtual interface which can be reimplemented to receive presence stanzas. 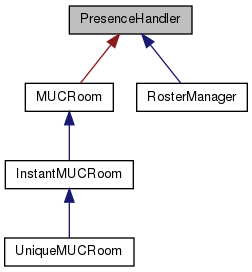 Derived classes can be registered as PresenceHandlers with the Client. Upon an incoming Presence packet handlePresence() will be called. Definition at line 30 of file presencehandler.h. Definition at line 36 of file presencehandler.h.